(Gr. christos, Christ, pherein, to bear. Lat. Christophorus, i.e. Christbearer). A martyr, probably of the third century. 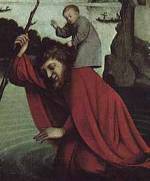 Although St. Christopher is one of the most popular saints in the East and in the West, almost nothing certain is known about his life or death. The legend says: A heathen king (in Canaan or Arabia), through the prayers of his wife to the Blessed Virgin, had a son, whom he called Offerus (Offro, Adokimus, or Reprebus) and dedicated to the gods Machmet and Apollo. Acquiring in time extraordinary size and strength, Offerus resolved to serve only the strongest and the bravest. He bound himself successively to a mighty king and to Satan, but he found both lacking in courage, the former dreading even the name of the devil, and the latter frightened by the sight of a cross at the roadside. For a time his search for a new master was in vain, but at last he found a hermit (Babylas?) who told him to offer his allegiance to Christ, instructed him in the Faith, and baptized him. Christopher, as he was now called, would not promise to do any fasting or praying, but willingly accepted the task of carrying people, for God's sake, across a raging stream. One day he was carrying a child who continually grew heavier, so that it seemed to him as if he had the whole world on his shoulders. The child, on inquiry, made himself known as the Creator and Redeemer of the world. To prove his statement the child ordered Christopher to fix his staff in the ground. The next morning it had grown into a palm-tree bearing fruit. The miracle converted many. This excited the rage of the king (prefect) of that region (Dagnus of Samos in Lycia?). Christopher was put into prison and, after many cruel torments, beheaded. 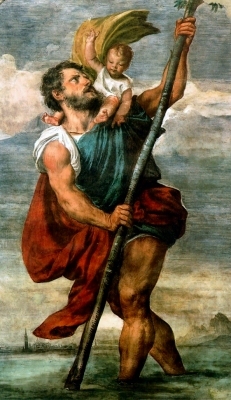 The existence of a martyr St. Christopher cannot be denied, as was sufficiently shown by the Jesuit Nicholas Serarius, in his treatise on litanies, "Litaneutici" (Cologne, 1609), and by Molanus in his history of sacred pictures, "De picturis et imaginibus sacris" (Louvain, 1570). In a small church dedicated to the martyr St. Christopher, the body of St. Remigius of Reims was buried, 532 (Acta SS., 1 Oct., 161). St. Gregory the Great (d. 604) speaks of a monastery of St. Christopher (Epp., x., 33). The Mozarabic Breviary and Missal, ascribed to St. Isidore of Seville (d. 636), contains a special office in his honour. In 1386 a brotherhood was founded under the patronage of St. Christopher in Tyrol and Vorarlberg, to guide travellers over the Arlberg. In 1517, a St. Christopher temperance society existed in Carinthia, Styria, in Saxony, and at Munich. Great veneration was shown to the saint in Venice, along the shores of the Danube, the Rhine, and other rivers where floods or ice-jams caused frequent damage. The oldest picture of the saint, in the monastery on the Mount Sinai dates from the time of Justinian (527-65). Coins with his image were cast at W�rzburg, in W�rtermberg, and in Bohemia. 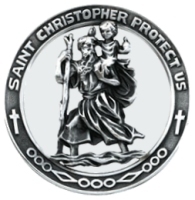 His statues were placed at the entrances of churches and dwellings, and frequently at bridges; these statues and his pictures often bore the inscription: "Whoever shall behold the image of St. Christopher shall not faint or fall on that day." The saint, who is one of the fourteen holy helpers, has been chosen as patron by Baden, by Brunswick, and by Mecklenburg, and several other cities, as well as by bookbinders, gardeners, mariners, etc. He is invoked against lightning, storms, epilepsy, pestilence, etc. His feast is kept on 25 July; among the Greeks, on 9 March; and his emblems are the tree, the Christ Child, and a staff. St. Christopher's Island (commonly called St. Kitts), lies 46 miles west of Antigua in the Lesser Antilles.